Captain America: A Not So “Marvel”-ous Move | Warped Factor - Words in the Key of Geek. Isa Gunther addresses the recent Captain America story line. 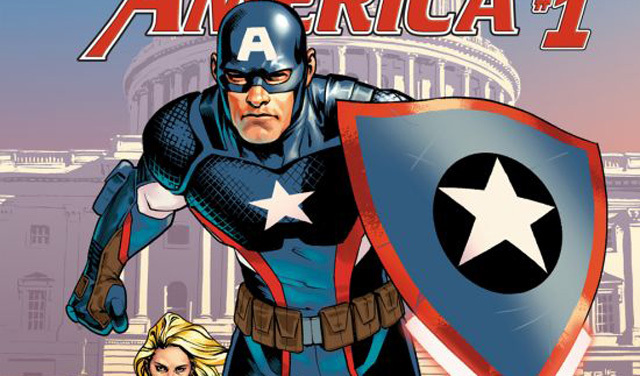 I have a hell of a lot of sympathy for the Marvel fandom right now in regards to “Captain America.” Their “Cap” was their symbol of hope, on the surface, a True American Hero (TM) who would always stand for truth, justice, and the whole nine yards. Notice I didn’t way “the American Way,” because common decency, honor, and the courage to stand up to ALL the evil in the world is not just limited to the United States. For the past god knows how many years, millions of people have held Captain America up to their own highest standards. Children have dressed up as him for costume parties and Halloween. Others have seen him as an icon and role model, and have used him to guide them through some of the toughest times in their lives. And now, this person who has been their hope and role model, and may possibly have saved lives...is HYDRA. A villain. The very personification of the evil they fought. I know full well right now, all over the comic book fandom, there are children sobbing in their bedrooms. The same bedrooms that have...or in this case, had, Captain America bedsheets and curtains and actions figures and God knows what else. There are children and adults who are feeling betrayed by the ones they trusted to keep their dreams and hopes and ideals safe. And I’m not talking about Cap. I’m talking about his writers. We, as fans trust our writers to hold our dreams in safety and to always do what’s right by the fans. Yes, the writers can subject our heroes to torture, suffering, loss, grief, but they will always come back to be their best selves because they are our heroes and that is what heroes do. That is what makes them so inspiring to us, because if they can suffer all of that and still be good people, then anything life can throw at us common folk seems like a walk on the beach as long as our heroes are beside us to help us through it. Captain America has not betrayed his fans. His writers have. His writers have betrayed and disappointed Cap’s fans in the worst way possible: they have made him evil. He didn’t just turn evil; the way the story goes, he has *always” been evil. Writers seem to think that their job is to be clever. It's not. The writers' job is to tell us stories, good stories, and characters that we can relate to, if not identify with. This goes double for superhero stories: our superheroes give us strength, they reflect our own ideals and courage back to us. These characters speak to the minds and hearts of millions of people and are heavily marketed towards children. I have seen this happen once before, on a little show called “Heroes.” From being the critics’ and viewers’ darling in 2005 to being cheerfully derided in 2010, the shows’ characters went through similar journeys: unknown to hero, hero to villain, villain to hero. Remember what happened to that little show that could? It got unceremoniously canceled. Changing the mythology of our superheroes, whether it's Batman using a gun, Superman being a self-righteous idiot, or Captain America being a Nazi sympathizer, goes against everything we as a culture have been taught to believe about them and about ourselves and our world. If those who have always kept us safe are one the side of evil, have we ever really been safe? If we look up to them and model ourselves after them, does that make us evil? At this point I don’t care about storyline. I don’t care if it turns out to be brainwashing, or alternate universe, or a dream, or whatever trope the writers use to get themselves out of this mess. This is nothing more than lazy and childish writing, done for the shock value and not to serve the story. This is writer masturbation, writers thinking they’re clever and glorifying evil, just for the sake of a few more sales or more press. This shows that a writer cares more about showing how clever he is than how much he cares about the fans or the half-century long legacy behind the character and the larger universe.